Anyone looking for high quality documents should purchase the Brother TN-348BK Super High Yield Black Toner for your Brother laser printer. This high quality toner delivers excellent prints and images. The best part is that high yield toner cartridges save you money and time. This toner cartridge was designed to complement your Brother Machine technology for superior image quality. The best part is that high yield cartridges reduce cost. They are perfect for busy offices. Brother also delivers excellent toner cartridges for your home. These high yield cartridges are perfect for printing school work or personal documents. Printing can be expensive, but Brother's has worked hard to deliver affordable printing solutions. The toner can be used with the Brother MFC-9460CDN, 4570CDW, DCP-9055CDN and HL-4150CDN. The anticipated page yield is 6,000 pages. Plus, the Brother Toner TN348 will save you time since you don't have to change it as often. Brother toners feature a design that works at different temperatures and maximises print quality. This toner helps to keep your Brother printer running smoothly day after day. 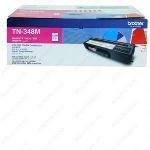 The Brother Toner TN348 can be recycled, which is perfect since it avoids filling landfills. Brother aims to provide environmentally friendly printing. High quality prints are what you get with the Brother Toner TN348. The toner delivers professional quality prints that are perfect for professionals. Hospitals, retail businesses, lawyers, and government offices use Brother Toner. Anyone looking for the best toner cartridge will not be disappointed. Purchasing toner has never been easier. High quality toner for Brother Printers can be purchased online. Anyone who owns a printer no longer has to go to the store. Conveniently order your toner online and it will arrive at your front door. This saves you time and money. Busy people enjoy the convenience of the Brother Toner TN348 cartridge. Brother toners were created to work with your specific printer. They are manufactured according to the highest standards. Genuine Brother Toner and other laser printer accessories are the best way to protect your investment. They provide the highest output that won't leave you disappointed. Prints are clear and of professional quality.